The female puppy, who police officers named “Puppy Doe,” was found abandoned in the woods in Quincy, Massachusetts on August 31, 2013. 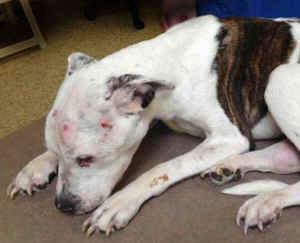 She was found with broken bones and other injuries that indicated severe and routine torture, starvation, and mutilation; Puppy Doe was euthanized to relieve her suffering by veterinarians at the VCA South Shore Animal Hospital in Weymouth. If you have information relating to the identity of the person or persons who mutilated this puppy, please contact the Quincy Police Department (Detective Thomas Pepdjonovich at 617-745-5774), the Animal Rescue League of Boston (617-226-5610), or the Animal Legal Defense Fund (707-795-2533, x1010). ALDF’s reward offer is in addition all other reward offers made in this case. BOSTON — In an effort to supplement the excellent work of local law enforcement, the national nonprofit Animal Legal Defense Fund (ALDF) is offering a $2,000 reward for any information leading to the arrest and conviction of the perpetrator(s) who savagely tortured a pit bull puppy over the course of several months. The female puppy, who police officers named “Puppy Doe,” was found abandoned in the woods in Quincy, Massachusetts on August 31, 2013. She was found with broken bones and other injuries that indicated severe and routine torture, starvation, and mutilation; Puppy Doe was euthanized to relieve her suffering by veterinarians at the VCA South Shore Animal Hospital in Weymouth. According to the Boston Herald, the veterinarian who performed the necropsy of Puppy Doe reported that the puppy’s limbs were repeatedly pulled apart in a “medieval style,” and the puppy was beaten, stabbed, and burned. Dr. Martha Smith-Blackmore of the Animal Rescue League called it “hands down” the worst case of animal cruelty she had ever seen. At a mere 18 pounds, the puppy weighed less than half her ideal weight, had her tongue split in two, and had been stabbed in the eyes. Under Massachusetts state law, such aggravated animal abuse constitutes a felony and could mean a maximum of five years in prison and up to a $2,500 fine.